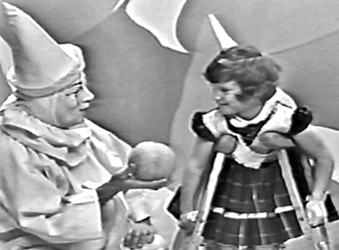 Command Performance For Nancy was a half hour television salute to Nancy Dykstra, the United Foundation torchlighter for 1963. The program was hosted by Executive Vice President of the United Foundation of Metropolitan Detroit Walter C. Laidlaw, and featured a handful of Detroit’s leading radio, television, sports and stage stars, all performing for Nancy. 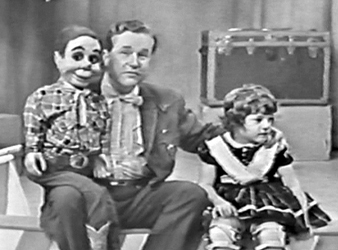 Of particular interest to fans of this website is Nancy’s visit with Milky the Clown, Bozo, Sagebrush Shorty, Ricky the Clown, Captain Jolly, Larry Sands, Jerry Booth and Johnny Ginger. 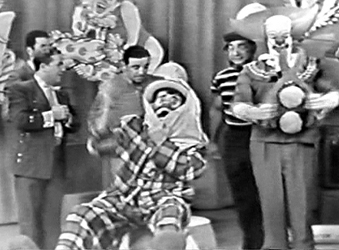 The special was taped at the WWJ studios and aired on WWJ, WJBK and WXYZ. Nancy’s family was given a 16mm kinescope copy of the program. Very little footage of Detroit TV kids show hosts has survived, making this a super rare find. 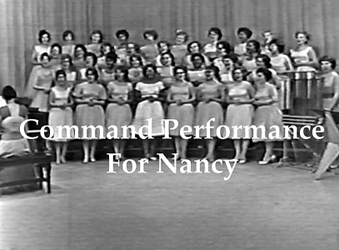 Thank you, Nancy, for sharing your Command Performance with us. Click on the photos to see video clip.